Cast: Sudheer Babu, Aditi Rao Hydari, Naresh, Rahul Ramakrishna, Pavitra Lokesh, Tanikella Bharani, Nandu and Others. Indraganti Mohan Krishna carved a niche for himself by attempting films in various genres. Be it 'Ashta Chamma', 'Golconda High School', 'Anthaka Mundu Aa Tarvatha', 'Gentleman' and 'Ami Thumi', Each one of them are quite different from one another. 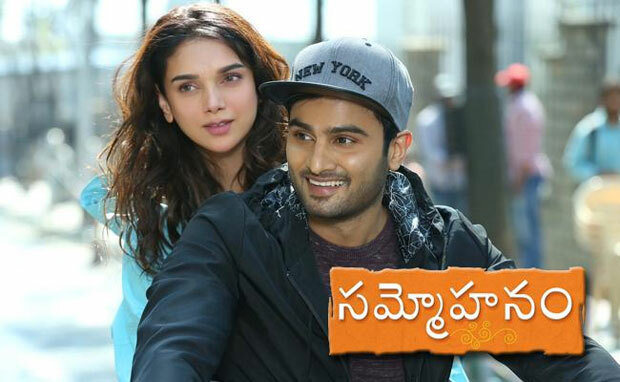 This time, Indraganti came up with 'Sammohanam' starring Sudheer Babu and Aditi Rao Hydari. Vijay (Sudheer Babu), a cartoon illustrator who doesn't have a good impression about either Cinema or Film Stars. Whereas, Vijay's Father (Naresh) is crazy about films and even permits shoot of a movie in his house. That's how Vijay happens to meet the Star Actress Sameera Rathod (Aditi Rao Hydari). While being a Telugu tutor for her, Love blossoms betweenVijay and Sameera. However, Sameera distances herself from Vijay due to her personal problems. What are those issues and how did the love story end forms rest of the tale! Sudheer Babu improved a lot in terms of dialogue delivery. He gave a settled performance and was good in emotional scenes. Aditi Rao mesmerizes with her beauty & acting skills. The way she conveys a lot of emotions through her eyes is a delight to watch. Behaving normal while being in pain is never gonna be easy. She portrayed the role of the Actress with few issues to perfection. After the lead pair, Its Naresh who leaves a strong impact. He should be given credit for the entertainment quotient. Pavithra Lokesh does a fine job. Tanikella Bharani, Kadambari Kiran and Rahul Ramakrishna have done justice to their roles. Technicians have been the backbone for 'Sammohanam'. 'Pelli Choopulu' fame Vivek Sagar has given feel-good music. Even Background Score is good enough. PG Vinda made the whole movie look colorful with his Camera Work. Producer Sivalenka Krishna Prasad maintained good production values. Yet again, Indraganti Mohan Krishna left a mark of his own as Writer and Director. With a refreshing Story and Screenplay, He brought the right amount of feel required to hit the bull's eye. Films in other genres have an expiry date but Love Stories are ever green. If the Lead Pair share a crackling chemistry & audience could relate to them, Such films will be definitely embraced by the movie lovers. Films like 'Ninnu Kori' and 'Tholi Prema' set a best example. Those subjects are in sync with the mindset of the present generation. Even 'Sammohanam' is such a refreshing and matured Love Story. Love between a Film Star & Normal Person itself is a unique point. Indraganti used this concept to pen refreshing sequences. He etched the role of Female Lead so well to leave a lasting impact. Even casting of Aditi Rao Hydari brought a fresh appeal to the project. Director presented the positives and negatives in film celebs in a realistic manner. In the process, He threw few satires on the Industry. At the same time, Film Industry wasn't shown in a degrading manner and right balance has been maintained. An indication has been given that even Film Celebs have personal issues just alike common man. Indraganti took his own sweet time to get into the actual story. The pace picks up only after the entry of the Heroine & her role raises curiosity right from the beginning. Sequences based on the Film Shooting has been written and executed so well. Scenes between Hero & Heroine are quite interesting. Presentation of the Love Story has been impressive. The terrace scene shows the real calibre of the Director. Post Interval, The Film slows down a bit & that's the only major flaw one can notice. Indraganti succeeded in bringing good feel with the way he handled romance and pain in separation. Naresh's Viswaroopam Scene in Pre-Climax is hilarious. It's too early to say about the reach of this movie because of the class touch. Overall, 'Sammohanam' is a must watch for those who crave for Love Stories. Bottom Line: A Sensible Love Story!